Alphabet letters of all sorts of shapes and sizes and styles—from blinking neon ones, to unusual old-style graphic ones to rustic hand-painted ones have been photographed and collaged together into an exuberant, eye-popping, letter-and-word-finding tour of the glories of the state fair. 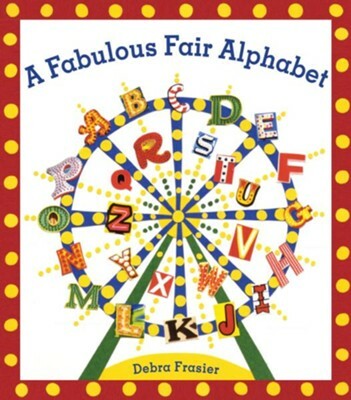 Bursting with with bright, bold illustrations of favorite fair elements like dill pickles and Ferris wheels and midway games, here is an alphabet-exploring adventure like no other! I'm the author/artist and I want to review A Fabulous Fair Alphabet.